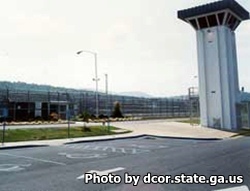 Hays State Prison is located in Trion Georgia, part of Chattooga county. It is a closed custody facility that houses approximately 1,100 adult males who have been convicted of a felony. The general population is housed in ten open dormitories, inmates can also be housed in the annex or segregation which consists of single cells. The facility is also responsible for housing 500 level II mental health inmates. Work detail for selected inmates includes working in a mattress manufacturing plant, working for Aramark food services, and various supervised positions within the county. Academic courses at this facility include adult basic education, literacy classes, and GED courses. Worship services and a faith and character based dorm is overseen by the Chaplains office. Inmates can receive counseling in anger management, family violence, behavioral modification, career building and re-entry preparation.